Great San Francisco Earthquake at Post and Grant streets. 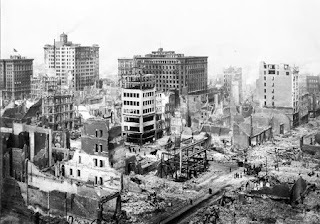 If an earthquake, similar in size and origin to the April 18, 1906 Great San Francisco Earthquake hit the same area today, the devastation would include as many as 90,000 homes and 26,000 other residential properties destroyed or structurally damaged and as many as a quarter million people displaced in 19 counties. Earthquake country residents would be remiss not to prepare (This story posted at 5:12 a.m. -- the same time the Great Quake struck, 103 years ago.). Deadline Newsroom - The magnitude 4.3 earthquake that hit the foothills along the fringes of Silicon Valley, March 30, came with the discovery of a new fault and renewed calls for earthquake preparedness. The tremblor hit at 10:40 a.m., about 16 miles east of downtown San Jose, but caused no major damage, according to the U.S. Geological Survey (USGS). USGS and other scientists conclude that there is a 62 percent probability of at least one magnitude 6.7 or greater quake, capable of causing widespread damage, striking the San Francisco Bay region before 2032. If an earthquake, similar in size and origin to the April 18, 1906 (103 years ago today) Great San Francisco Earthquake, hit the same area today, the devastation will include as many as 90,000 homes and 26,000 other residential properties destroyed or structurally damaged and as many as a quarter million people displaced in 19 counties, according to "When The Big One Strikes Again," a study that recalls the devastation of the great quake, an estimated magnitude 7.8 to 8.25. Experts say, with such a potential for disaster, earthquake country residents would be remiss not to prepare on three levels. Structures most vulnerable to seismic activity and likely to cause death or injury are those built before 1974, especially before 1950. They were built without newer seismic building codes. Seismic "retrofitting" improvements can help these older structures better withstand a quake and the work can also land earthquake insurance discounts.  Buildings with "soft story" construction -- open, large, largely unsupported, ground floor spaces with living spaces above, such as car ports and garages.  Unreinforced masonry and concrete framed structures from chimneys to entire buildings.  Manufactured homes without property tie-down or bracing systems.  Poorly engineered hillside homes.  Homes near active quake faults, especially those on or near landfill or silty, sandy and loamy soils that can liquefy in a quake and amplify seismic energy.  Homes with existing structural weakening caused by, say, termite infestation, mold, dry rot, flooding, soil movement or erosion. Home owners may need the services of an engineer to evaluate the problems, according to the Association of Bay Area Governments and California's Seismic Safety Commission. Both offer seismic safety tips to make your home safe. The same agencies provide earthquake preparedness information to help you secure the contents of your home. The agencies say even moderate quakes can turn household items into deadly missiles. Here's how the experts say you can reduce the chance that your belongings will turn against you in a quake.  Secure, with flexible fasteners, large objects that could fall in a quake, especially top-heavy furniture and home electronics. Move heavy objects away from sleeping and sitting areas. Place only soft art above beds and sofas.  Use removable museum wax or earthquake putty or gel to secure knickknacks, gewgaws, collectibles, lamps, pottery and other valuables stored on open shelves and counter tops. Store heavy objects on low shelves or inside display cases fastened with quake or child-proof latches .  Secure heavy appliances. Quake country law mandates that water heaters must be anchored to wall studs with metal straps and lag screws. Likewise, use earthquake appliance straps to secure to walls refrigerators, free standing ranges, microwave ovens and other large, major appliances.  "Quake Alert: Secure Household Items" explains how to lock down everything from curios in showcases to home theaters in the family room. Your homeowners or rental insurance policy does not provide coverage for earthquake damage. Unless you can afford earthquake losses, live far from fault zones and or have a home that's highly resistant to seismic activity, you should consider special earthquake insurance. "With 88 percent of California homeowners not covered by (earthquake) insurance, who's going to pay the tab when the big one hits?," asked Pete Moraga, a spokesman for the Insurance Information Network of California (IINC). Earthquake insurance is available through insurers participating with the California Earthquake Authority (CEA). The CEA base-limits policy for homeowners includes coverage to the insured value of your home as stated on your homeowners policy; $5,000 in personal property coverage and $1,500 for additional living expenses or loss of use. Policies come with either a 10 percent or 15 percent deductible on your structure coverage. You can increase personal property coverage to as much as $100,000 and additional living expense coverage to $15,000. Discounts are available for those with homes that have been seismically retrofitted to better withstand an earthquake. To determine a CEA policy cost, a host of property factors must be considered. Use CEA's Premium Calculator to estimate your cost. Also see: "Putting Down Roots In Earthquake Country"